« Tupi Blackberry: feedback please? Mulberry: when should I transpant it? About 14 years ago, I took a smallish cutting from a large black mulberry tree in West Norfolk. The cutting grew slowly and steadily in a large pot and I promised it to a young woman who had lived at the house from which I took the cutting. However, she does not yet have a permanent place to put the mulberry. The cutting was beginning to look quite poorly by the end of each summer however carefully I looked after it and, in desperation, three winters ago I put it into my garden, assuming it would continue to grow as slowly as it had up till then in its pot. My thinking was that the soil is dry and sandy and over carrstone, sand and chalk layers and apart from the (very) occasional spray of seaweed liquid and an autumn handful of rock dust when everything else gets one, it has to fend for itself. It was an act of madness, as the mulberry plainly likes the spot and has grown very fast ever since it got its roots into the soil. 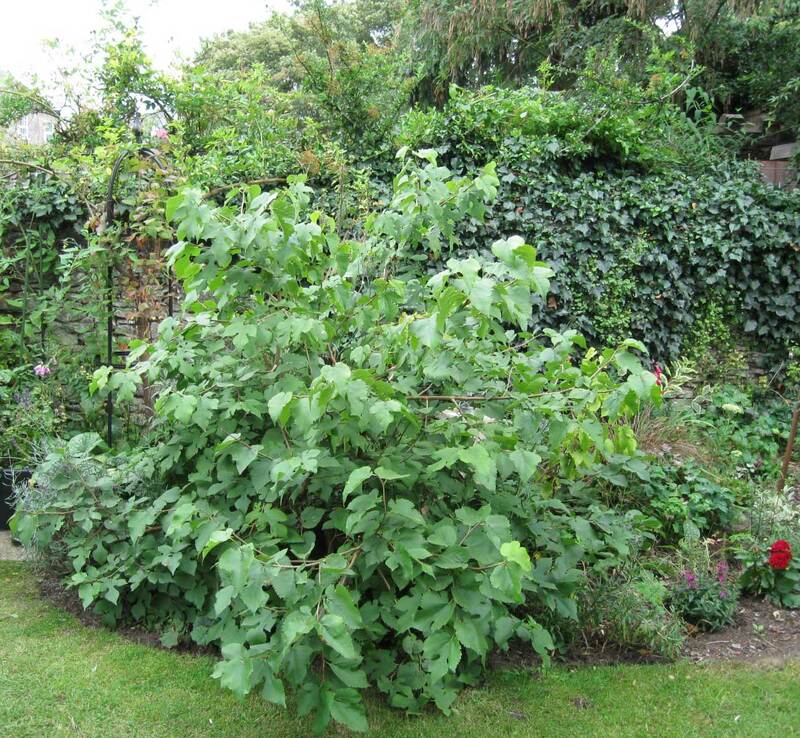 My question is this – what are the chances of my successfully digging up the mulberry in the next two years (it is currently about 4 feet high x 6 feet wide) and when should I undertake this task (presumably in its winter dormancy but is there an optimum time?). It can’t stay where it is for much longer but I would like to give it the best possible chance of surviving the uprooting. You could save yourself some backache by taking another cutting! There appears to be plenty of young shoots on the tree and you could even donate some to friends.However if you are determined to move it then I would suggest waiting till fully dormant but avoid lifting during frosty conditions. Best to get it settled into the new spot immediately. Plants growing well will have a canopy above ground equal to the root mass underground, a basic understanding when pruning any plant, and inevitably when you dig up a plant some roots will be cut off so upsetting this balance. To restore this balance you would need to prune the canopy when the mulberry is dormant in early to mid-winter. Usually assumed to be November/December and this is also by far the best time to replant to ensure sufficient root regrowth before leaves appear in the spring and require water for the photosynthetic process and leaf cooling in hot weather. It is going to require some muscle to dig out as much of the root as possible and then to move it particularly as it is beneficial to ensure soil remains around the roots as a root ball to reduce the prospect of the roots drying out and root damage. I would imagine you will need to cut the canopy to at least half of its current size if you dig out a rootball of approximately 45-60 cm diameter. The soil is still warm and starting to moisten in November which helps to ensure success, and there is enough time for roots to grow before leaf burst. Remember to protect from wind for the first season after transplanting to reduce water loss particularly from the leaves and water weekly particularly if the spring weather is similar to this year. A hessian screen would suffice as a windbreak to protect from the northern European winds experienced in East Anglia in the spring. Thank you very much for your advise, both of you. I think I will try both methods – cuttings and digging it up! If I offered rooted cuttings to gardening friends they might help me dig it up……. Apple Cores: when and why did we begin discarding the apple core? Perfect Nursery, Pontefract, Yorkshire: information please? Paradise Rootstock: where can I get it? Kalin on Vietnamese Apple – what kind of fruit is this? Dave Marshall on Which Blackberries are Best Suited to the UK?